Scalado Album is a new photo gallery app on Google Play. As there are lots of photo gallery applications out there already, what makes Scalado stand out from the rest? Hit the jump to find out! "Scalado is a world leading provider of mobile imaging technologies, with a long history of developing breakthrough innovative imaging products and platform-independent imaging solutions. Scalado has more than 50 patent and patent pending technologies and is currently being used by the world's leading global telecom and platform companies. Scalado technologies are in over 1 billion mobile devices, a figure growing with over 500 million each year. Scalado was established in 2000 in Sweden, and has offices in Sweden (HQ), USA, Korea, China, Taiwan & Singapore." So what does set Scalado Album apart from the competition? Well the main thing is speed. The app is absolutely lightning fast after the initial caching of the photos and when I say fast I mean FAST! Scrolling through the thumbnails is seamless as is flicking in-between full size photos, it handles both really well. The app also gives you extra viewing options than standard album apps give, with quick and easy access to Camera Roll, photos taken nearby, the month the photo was taken, places and theÂ separateÂ folders that your photos are in. Another great feature of the app is the little globe icon in the top left which takes you to a great little feature which, for you Mac users out there is very iPhoto-esque. It basically drops pins into the map at the locations where your photos have been taken as long as they have location data. Simply tapping on the pin opens up the thumbnails specific to that location. The speed at which it pans and zooms is also pretty excellent too. It definitely feels a lot smoother. A quick double tap shoots you into the detail almost instantly and panning around the photo is silky smooth. It also has animated thumbnails for videos which is a cute little feature too! However there are a few things that the app feels to be missing for example, the ability to hide certain folders / photos does not seem to be present and it doesn't take any notice to .nomedia files in the folder to exclude them from the library. It would also be great to be able to link online photo libraries like picasa or dropbox. 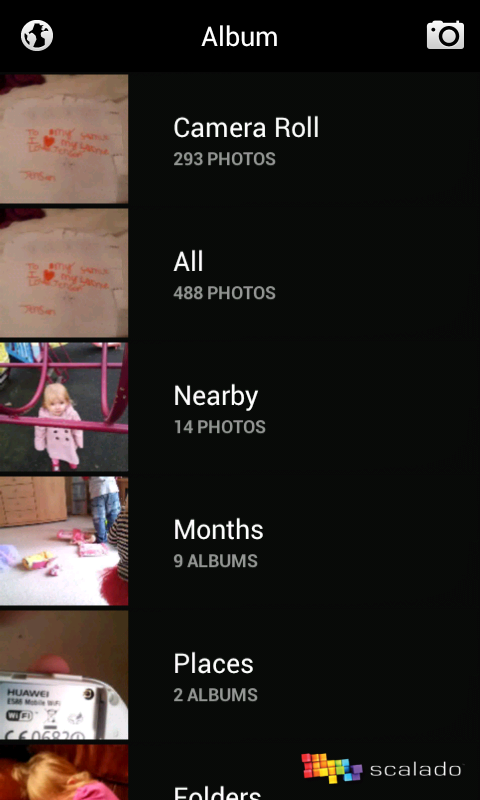 I have also noticed (but this may be me using CM9 on my SGS2) that when going into the camera via the app, if the phone is in portrait then the camera app would crash more often than not. Also, on occassion when trying to select photos to upload etc., instead of selecting the photo it would send the photos scrolling again. Overall this is a good app with a lot of positives and is definitely a serious contender to replacing my gallery on my phone. The app costs 65p ($0.99) which is great value. See below for the Google Play link, press release and video. The Scalado Album is designed for making your everyday photo experience great. We want to bring you the best user experience possible but still keep the design simplistic and responsive. 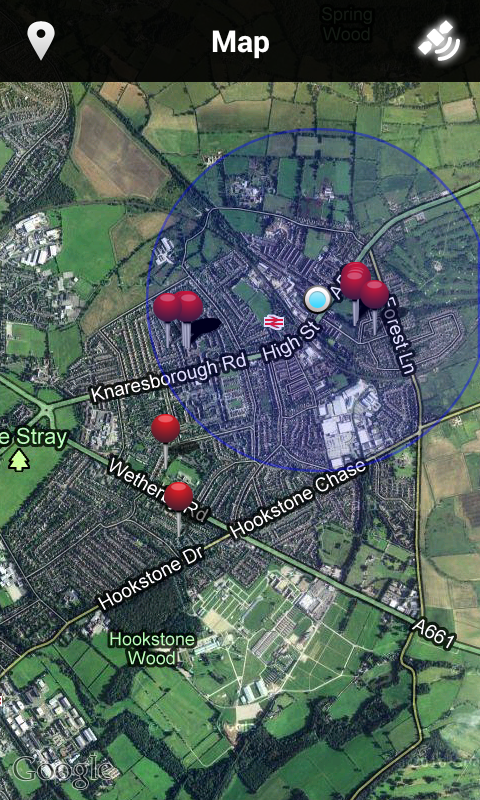 It is built from ground up using the Scalado Imaging Platform to enable maximum performance on Android. The album allows you to quickly find the photos you are looking for and you can smoothly zoom into every single detail in full resolution. Â Experience your photo memories and enjoy.